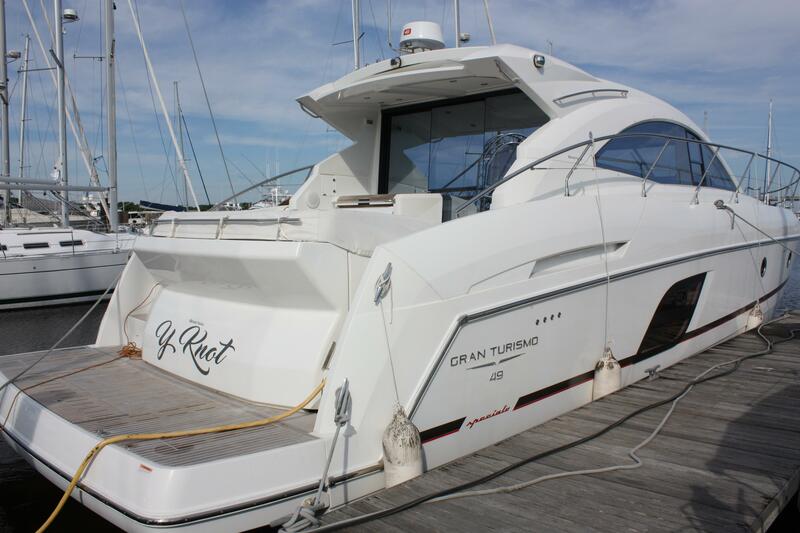 Board this 2016 Gran Turismo 49 via a beautiful, optional teak laid hydraulic swim platform. 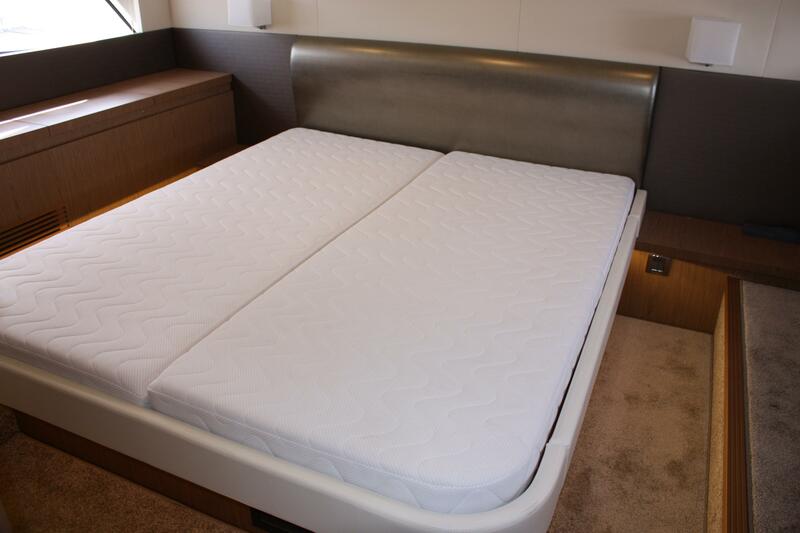 The swim platform comes with a removal folding stainless steel swim ladder, as well as a built in emergency boarding ladder. 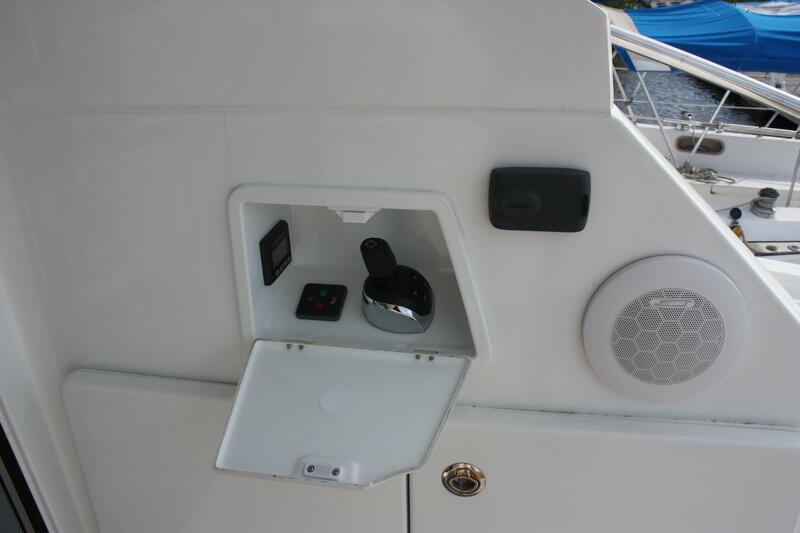 From the swim platform, you can access the tender garage (suitable for up to a 9’4” tender with engine) via a hydraulic transom garage door. 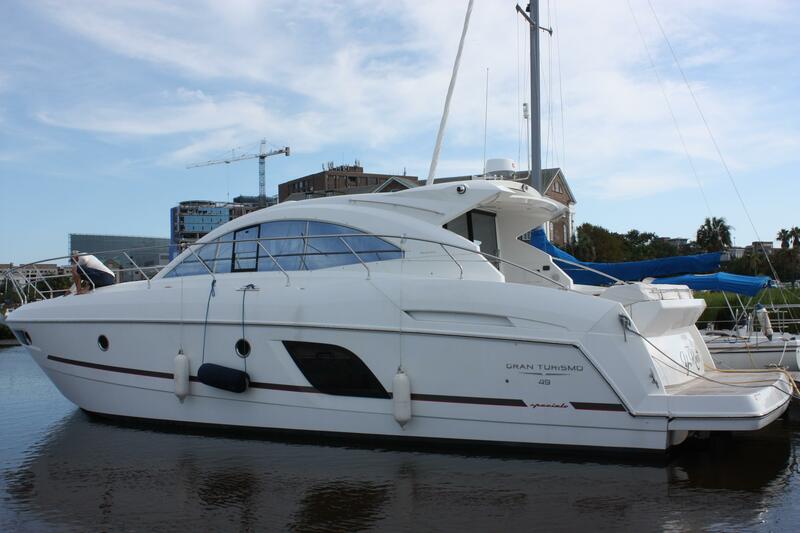 The garage is outfitted with a dinghy launch system and winch, making it easy to launch and retrieve your tender. 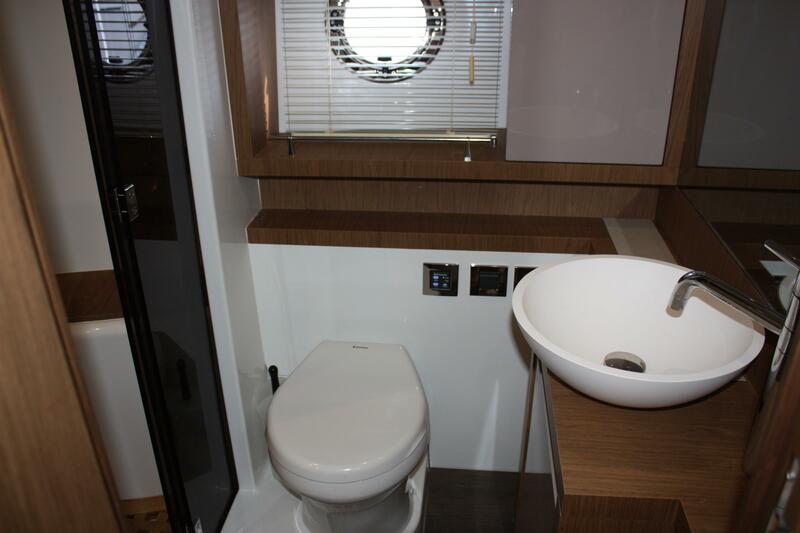 The garage is also accessible via a hatch below the cockpit seating. 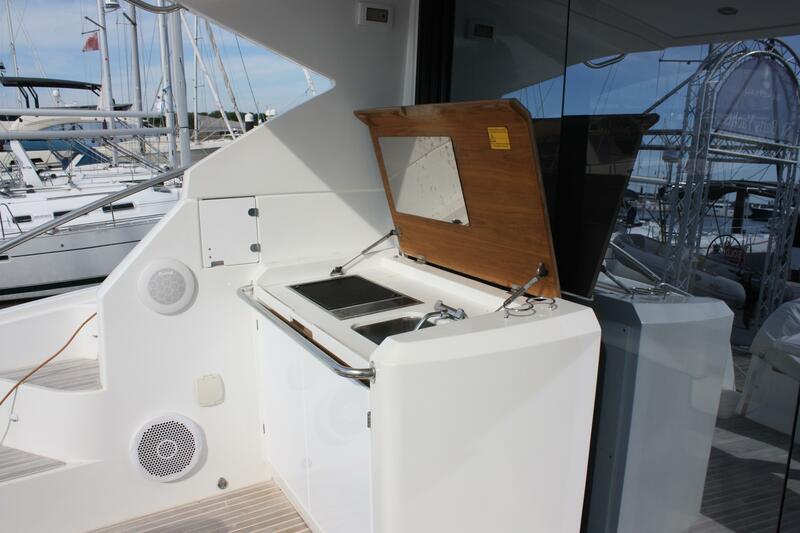 Through the port stainless steel boarding gate, you will enter the aft cockpit, with its beautiful teak decking. 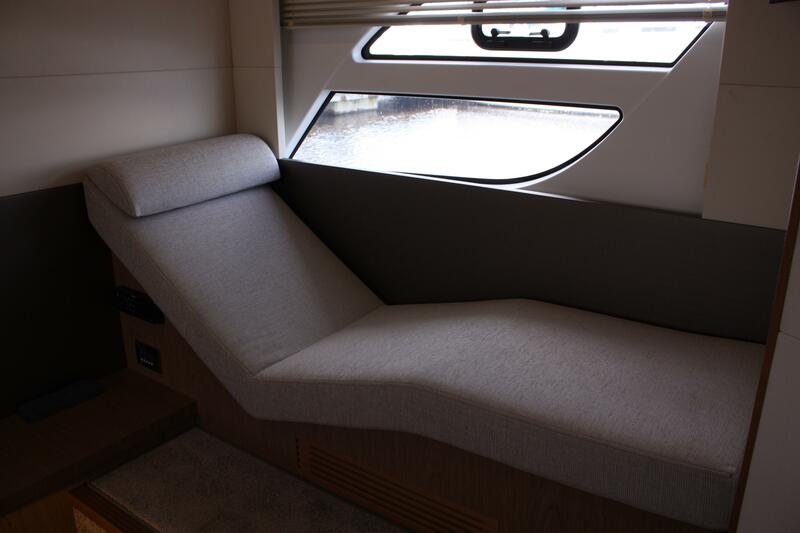 A large L-shaped bench offers seating for six and coverts to a sunbed with an the high/low cockpit table on electric pedestals. 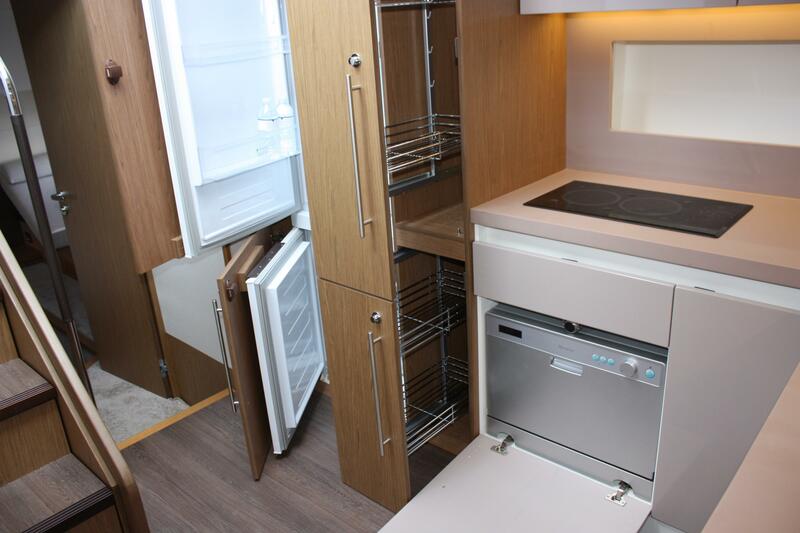 To port, the cockpit has a grill station with an electric grill, refrigerator, stainless steel sink and storage. 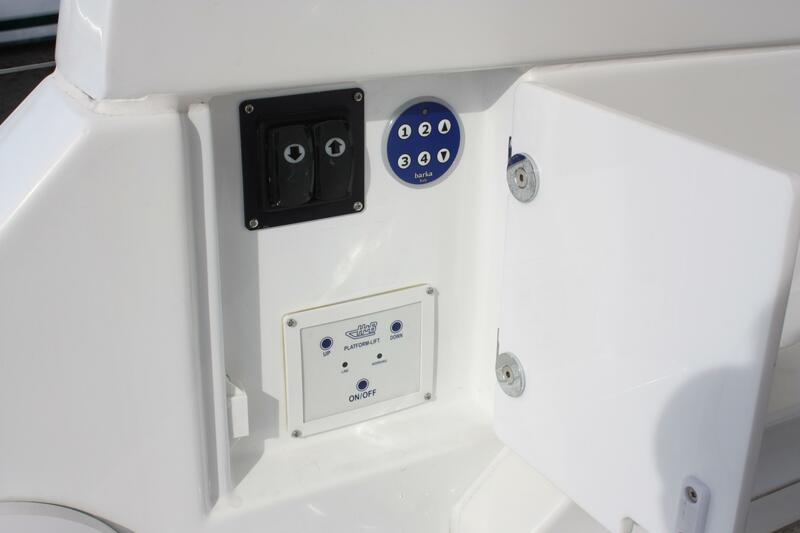 Also to port is a hot/cold fresh water shower and a compartment housing the hydraulic controls for the cockpit table, garage door, and swim platform. 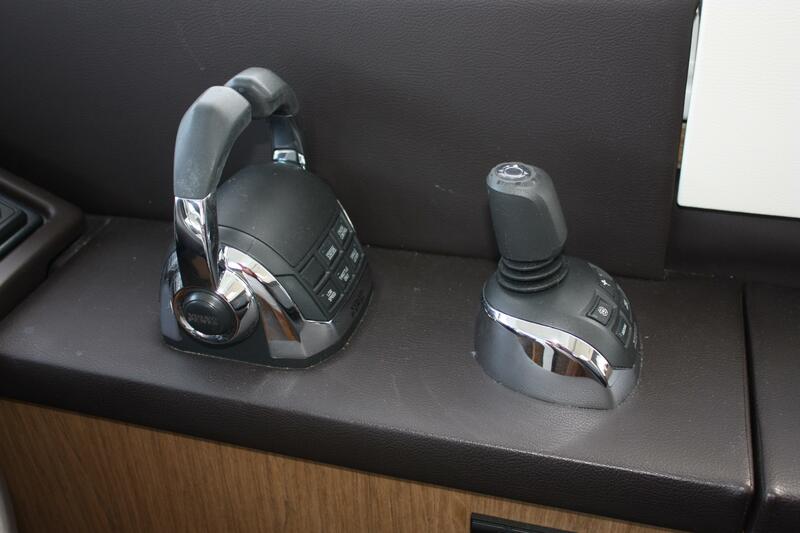 To starboard is an aft docking station with a Volvo Penta IPS joystick and bow thruster control. 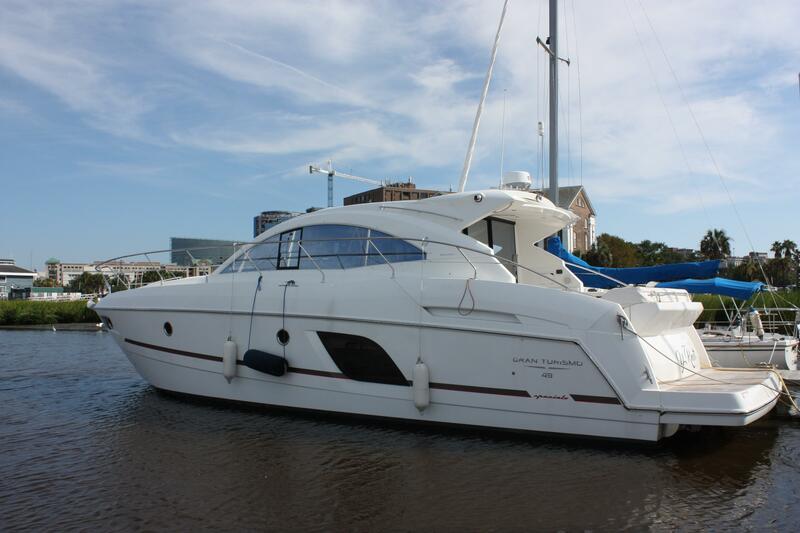 At your feet is an access hatch to the engine room. 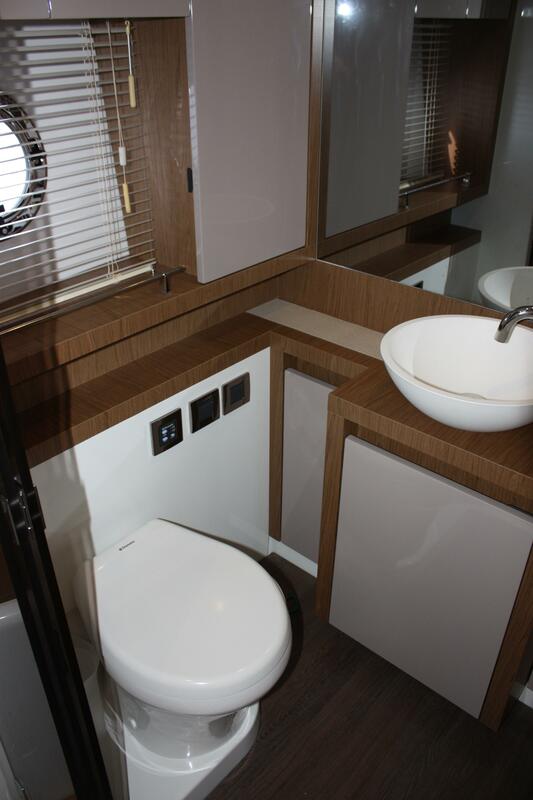 From the cockpit, enter the salon through a 3-panel sliding mirrored glass door. 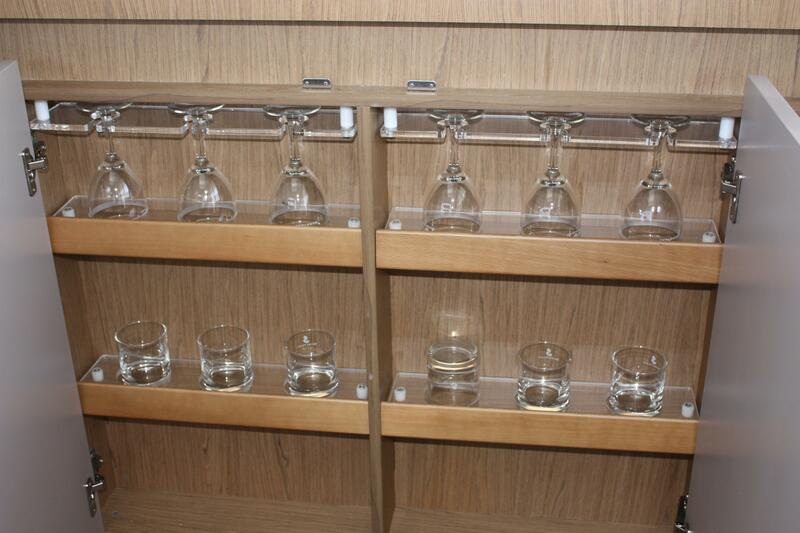 The interior is finished in a satin walnut. 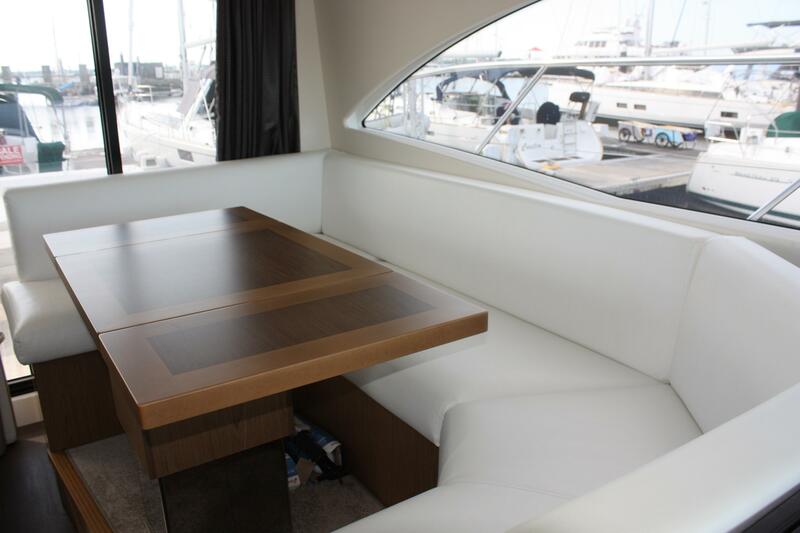 To port on a raised platform is a U-shaped settee with an electric pedestal high/low dinette/coffee table. 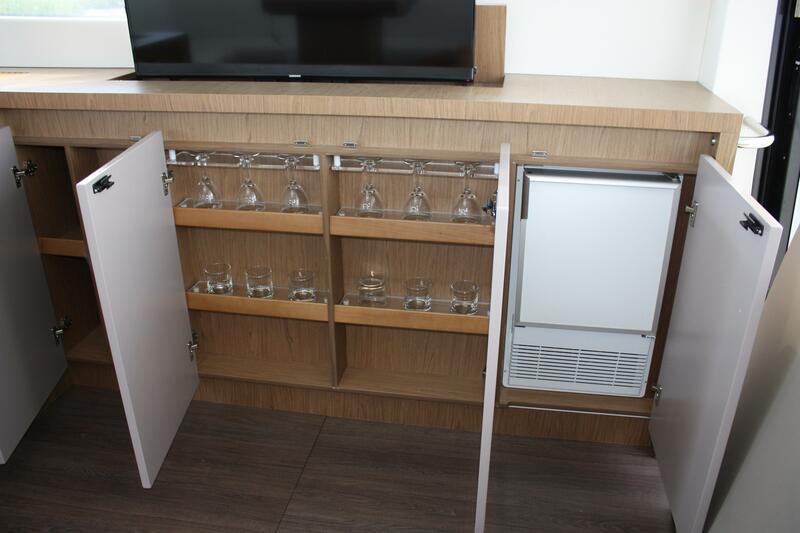 To starboard is a large sideboard bar unit housing an ice maker, glass storage, and an electrically raised and lowered 40” Samsung LCD TV. 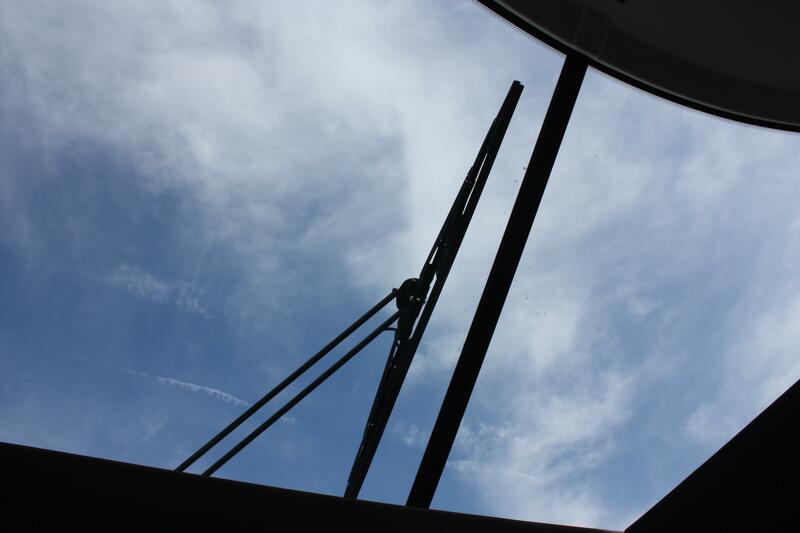 Panoramic windows and a large electric sunroof add to the open and airy feeling of the salon. 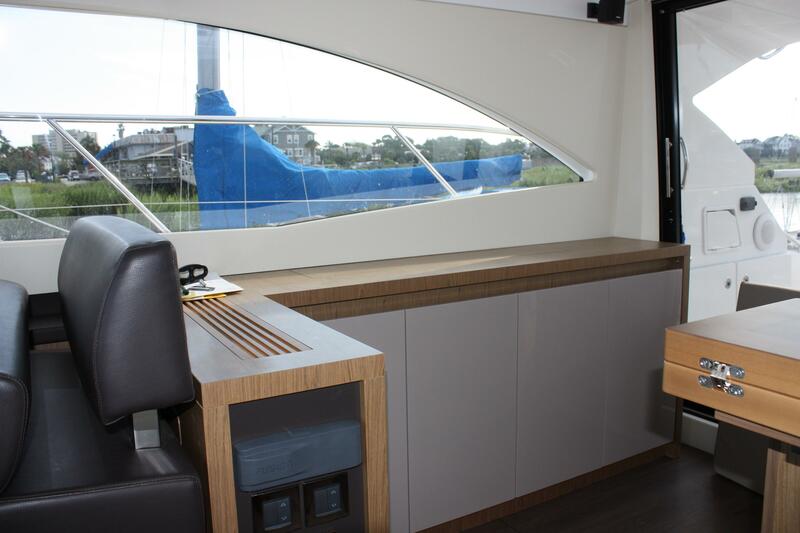 The helm is located to starboard and forward of the bar sideboard. 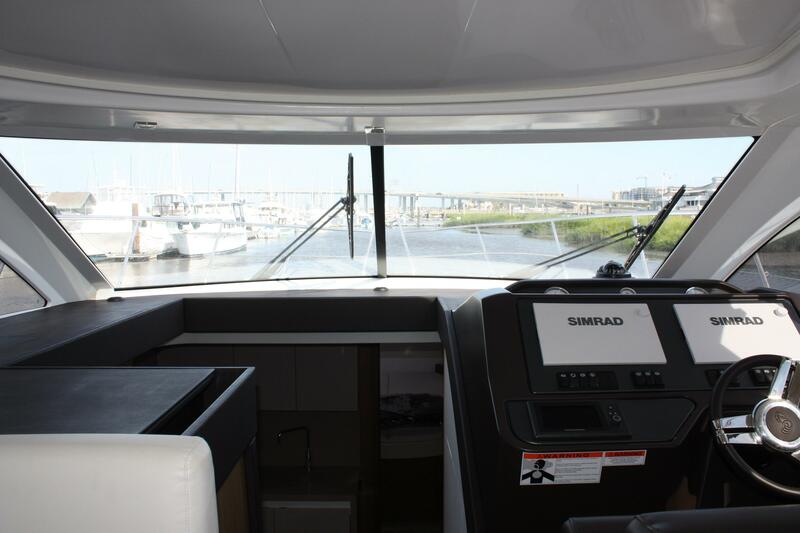 The helm is well-laid out with a suite of Simrad electronics. A double pilot bench seat with bolster, 6’6” headroom, and a large windshield with demister, wipers and washers, make for excellent visibility underway. 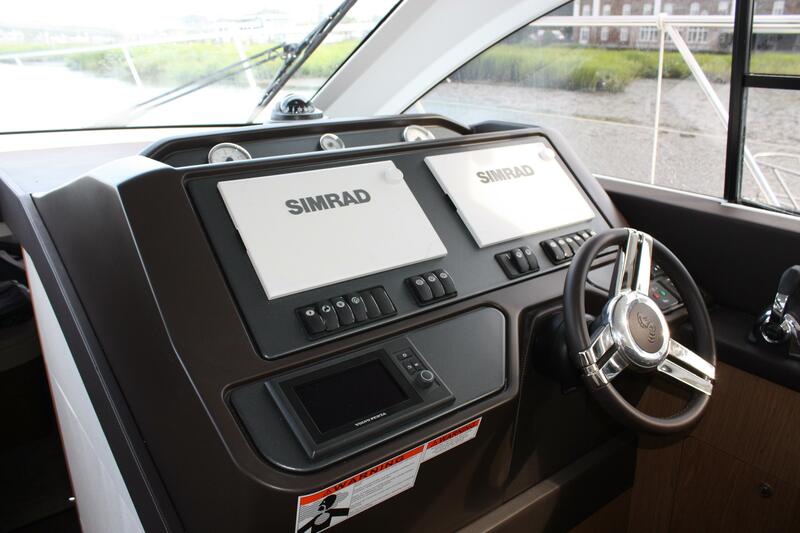 In addition to the twin Simrad NSS 12” multifunction displays, the silk-finish chestnut painted instrument panel includes a compass, revolution counter, rudder angle indicator, and a 7” Volvo Penta digital engine display. 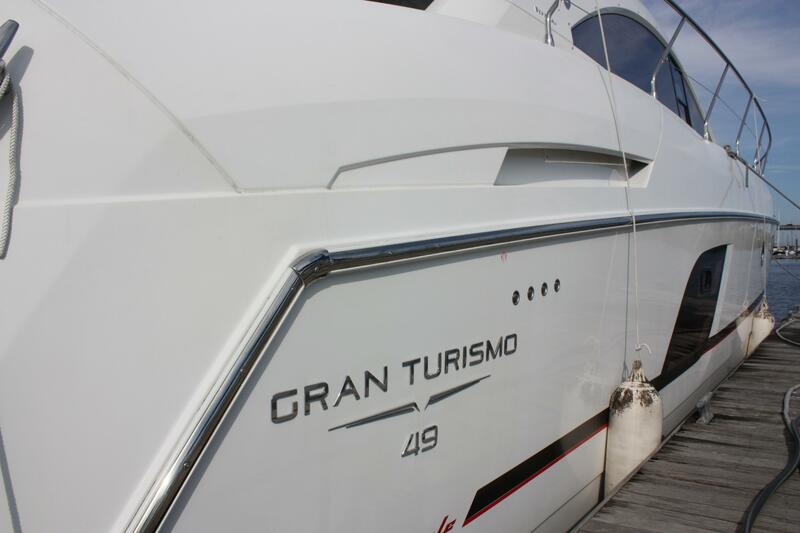 Throttles, joystick, and bow thruster control are all located to starboard of the wheel. 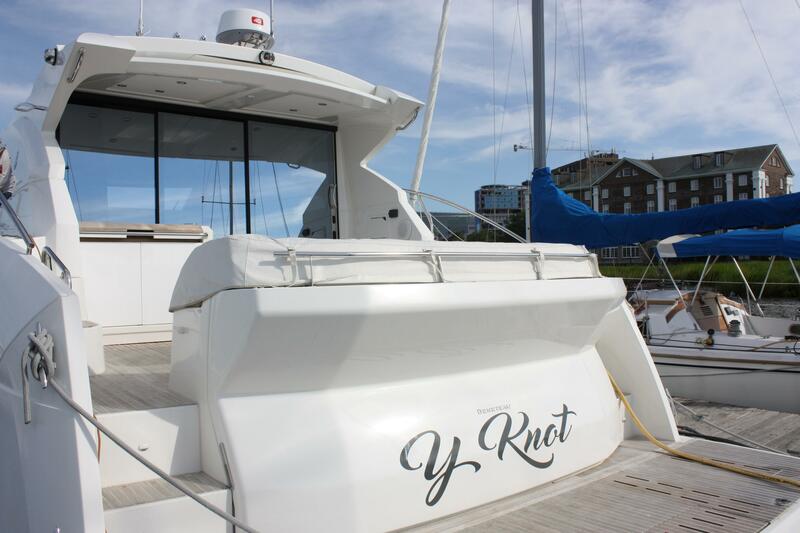 To port of the helm is a companionway that leads down to a centrally located galley. 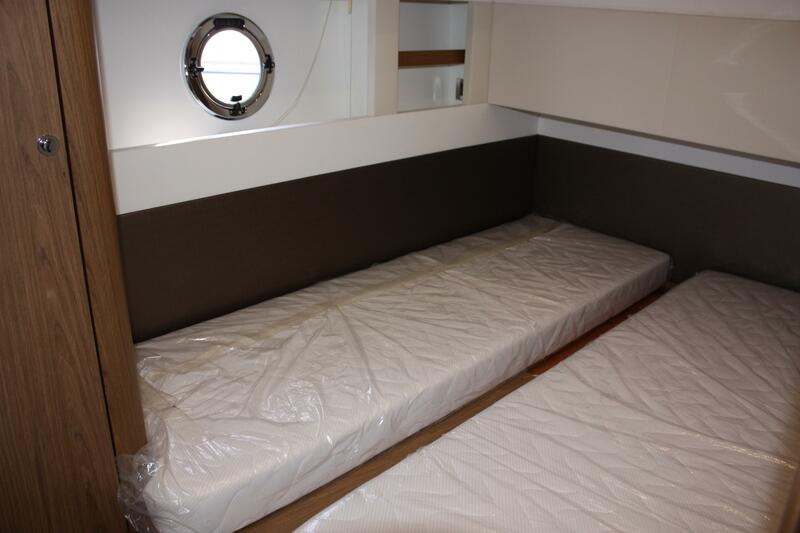 A large storage compartment is found beneath the companionway. 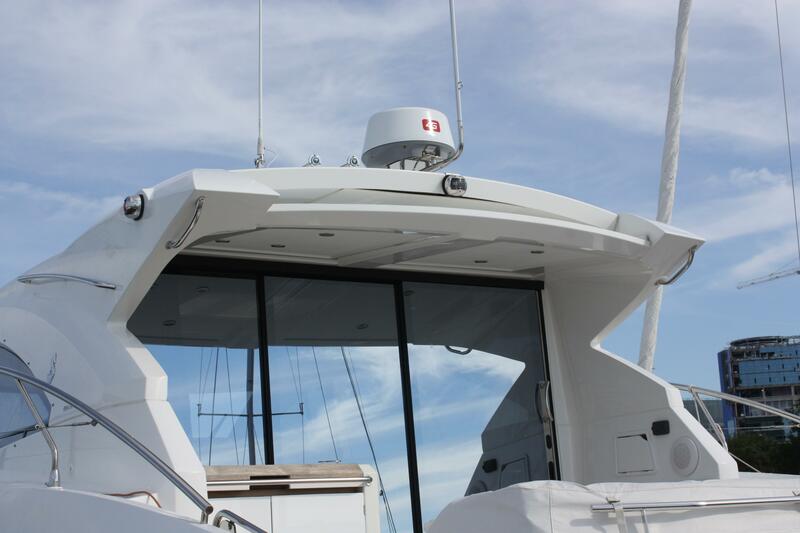 The port dash is cut away, opening the galley to the salon and light from the windshield and sunroof above. 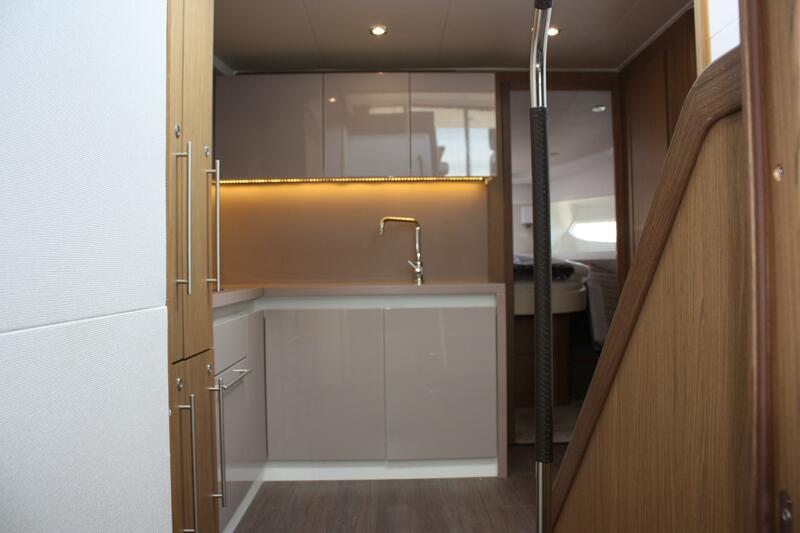 The galley has white Corian countertops and white cabinetry, making for a light and open feeling throughout. 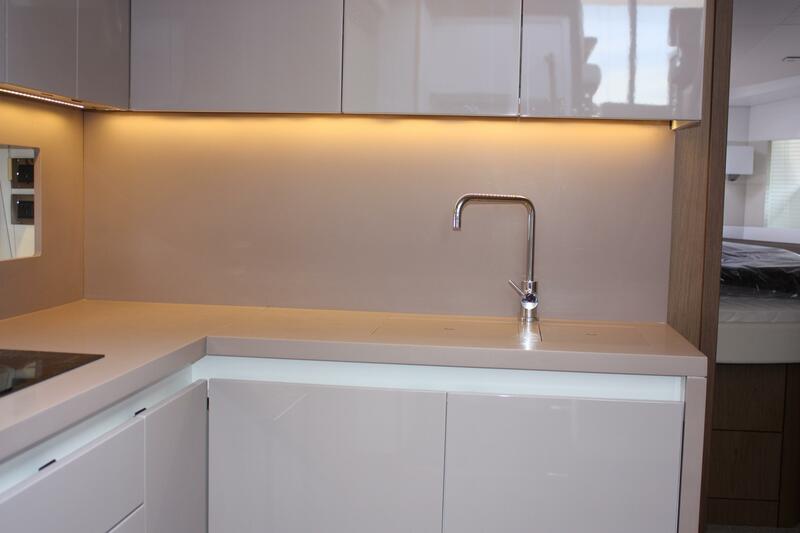 The countertop is equipped with twin stainless steel sinks and an electric two burner cooktop. 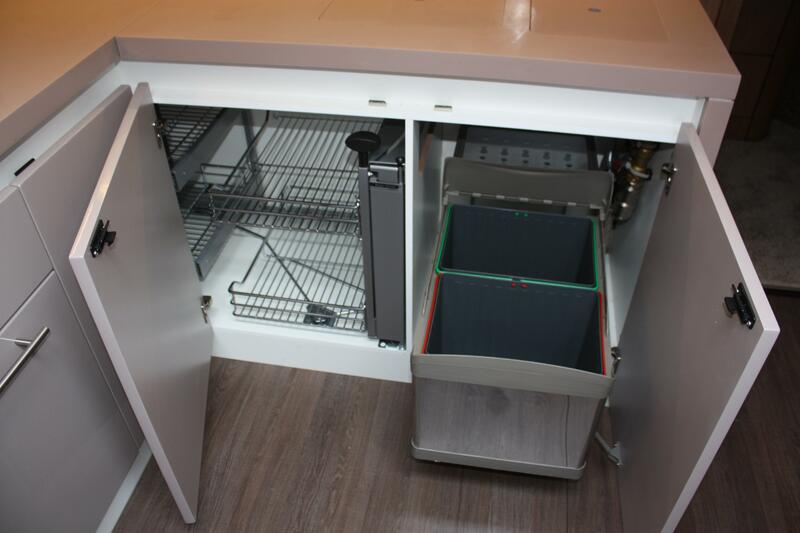 Below the sink are trash bins and adjacent to that is a storage area with magic corner wire shelving units to optimize the storage space. 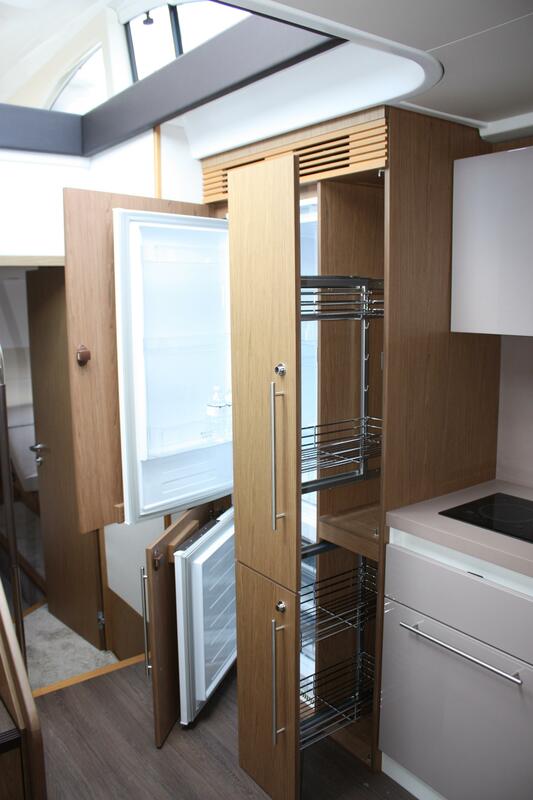 Above are ample storage units, one of which houses the microwave oven. 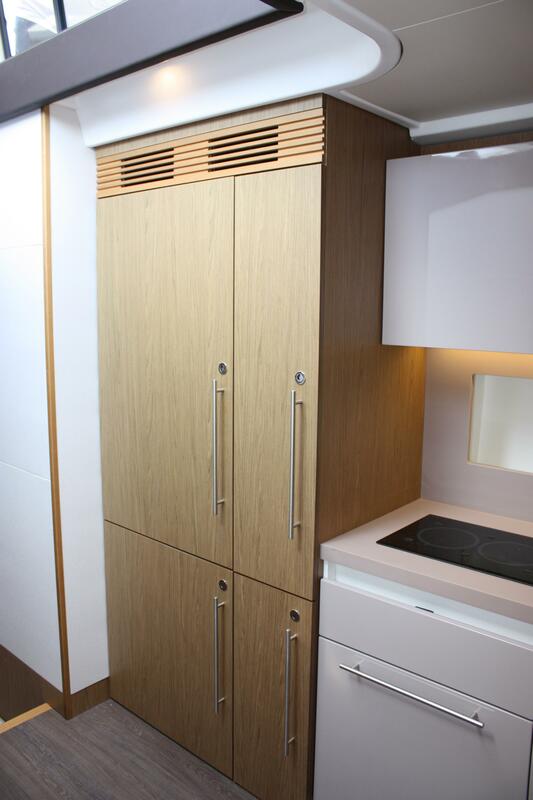 There is a full sized over/under refrigerator/freezer housed behind attractive wood paneled doors and next to the refrigerator are pull-out wire storage units that recess into the cabinet as well as a dishwasher. 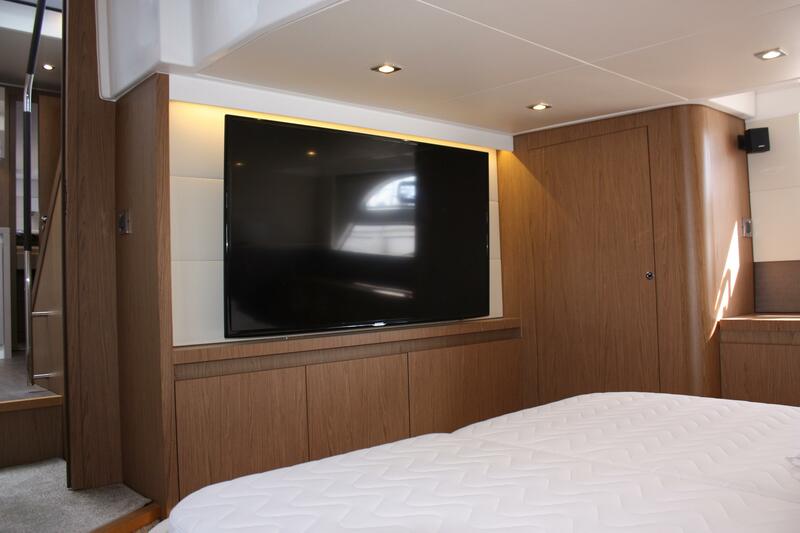 The Forward VIP stateroom offers an island queen, a large closet, ample storage, panoramic opening porthole-fitted portlights, an overhead hatch, and a 32” Samsung LCD TV mounted on the aft bulkhead. 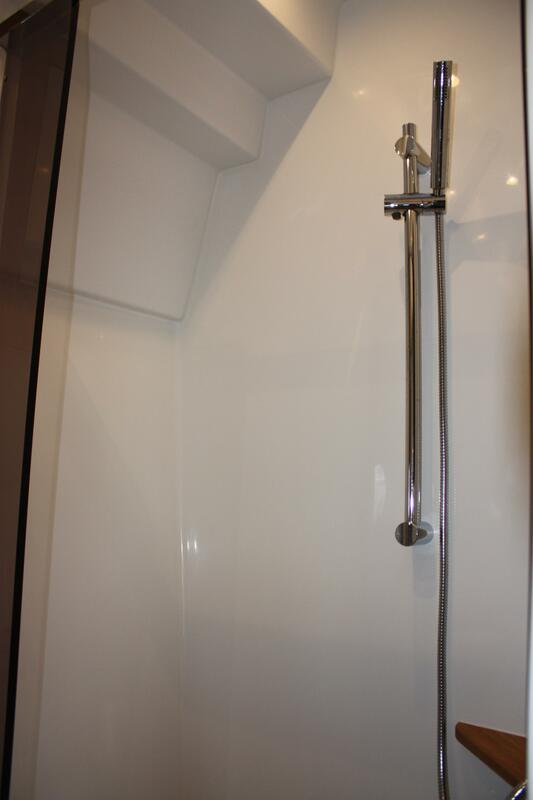 A guest/day head with an enclosed shower and opening port is located between the Forward Stateroom and the Lower Lounge. 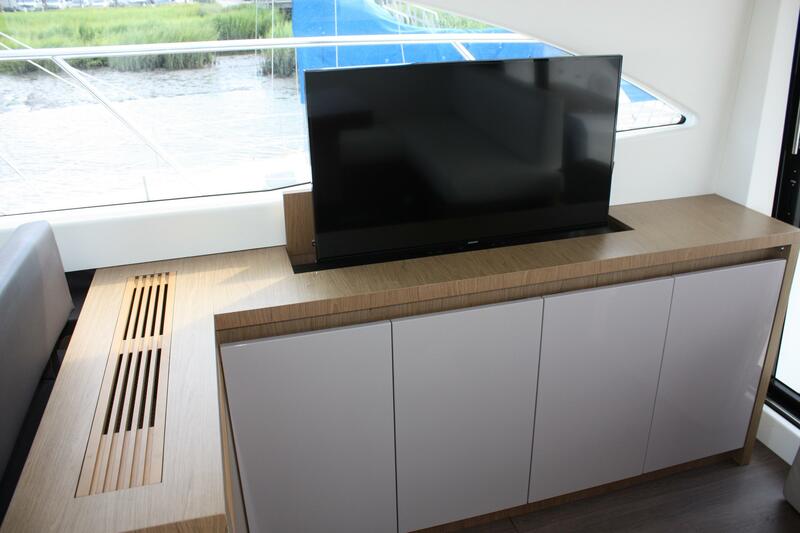 Starboard of the galley with two single berths, hanging locker, storage cabinets and a 27 inch SamsungTV. 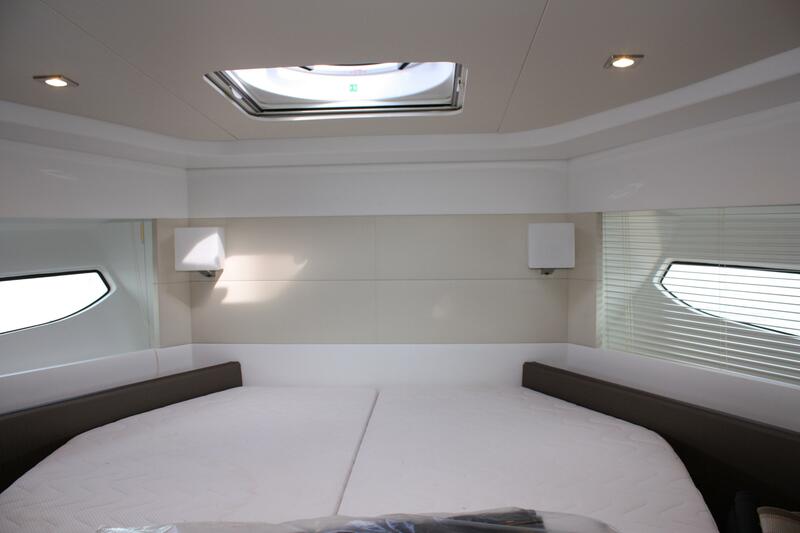 Aft of the galley is the luxurious full beam (14’) master stateroom with a large queen berth and en suite head and enclosed shower with skylight. 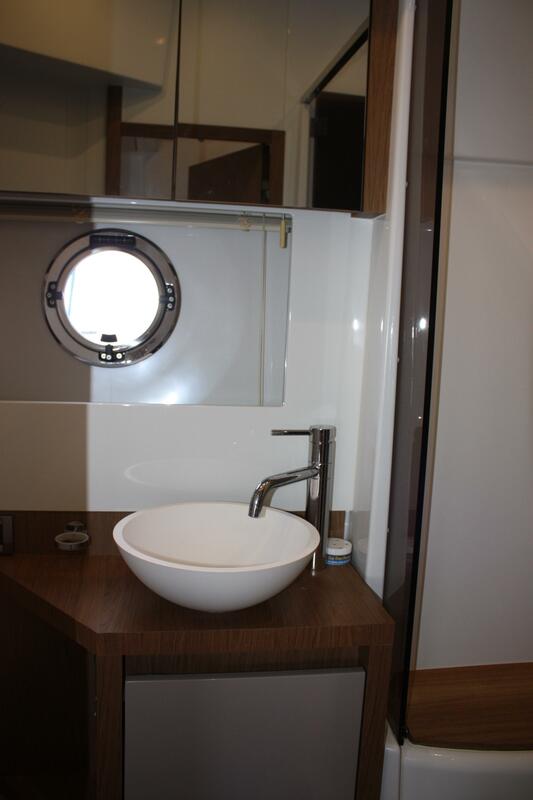 Large port and starboard panoramic portlights with opening portholes, along with overhead LED lighting and reading lights brighten the master. 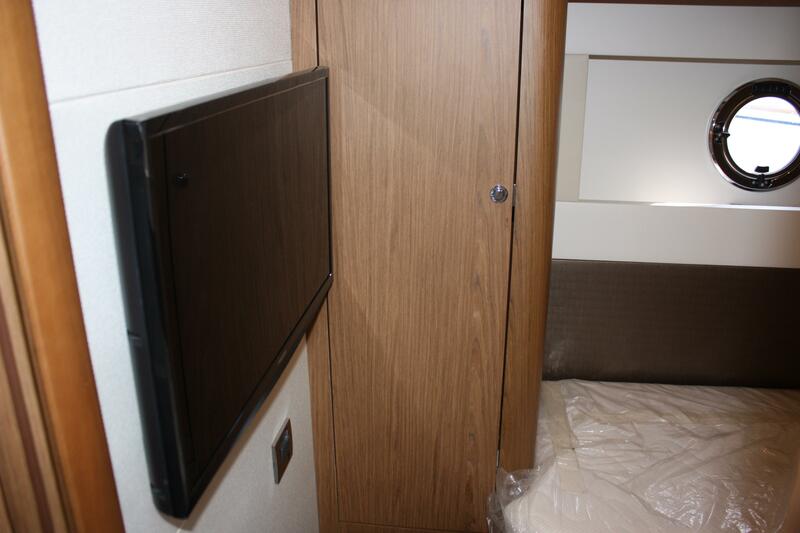 To port is a comfortable couch and to starboard is a large storage sideboard and a hanging locker. 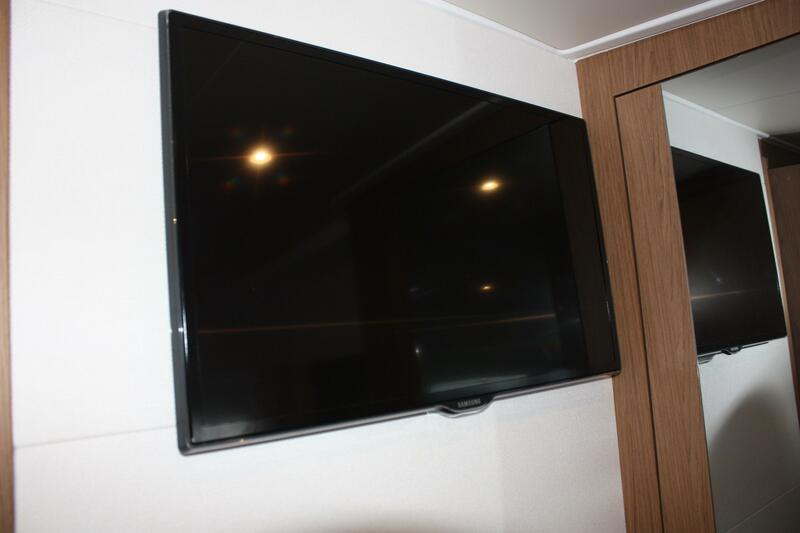 The master is highlighted by a 55 " Samsung TV. 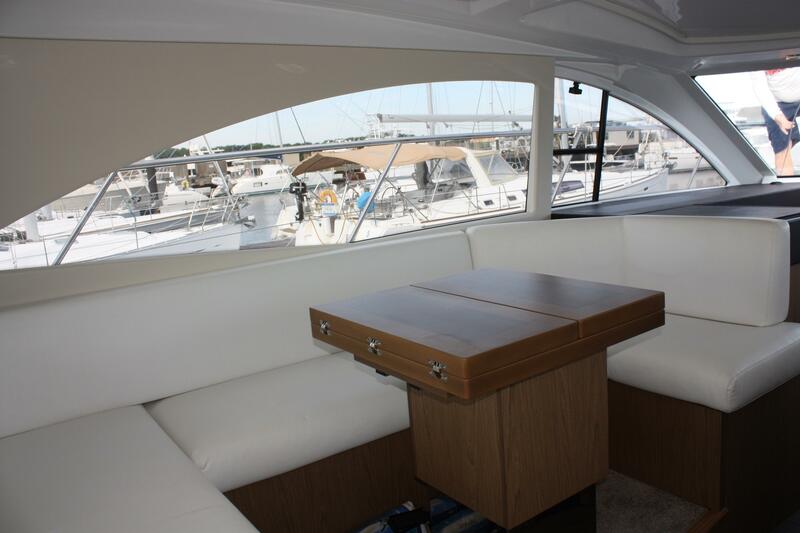 Back on deck, the wide side decks lead forward to an optional Sun Lounge on the bow and easy access to the foredeck, anchor locker, and a remote controlled Lewmar windlass and Delta Anchor.